Low Interest Rates – Although, not all balance transfer credit cards will come with an incredibly low interest rate, because of the nature of these offers, most of them are very, very competitive. Most balance transfer offers come with 0% promotional rates that will last from 6 to 18 months. After the promotional interest rate, the remaining debt will be charged the standard rate for the card, which is usually pretty competitive as well. The Ability To Transfer Debts – Unfortunately, you can’t use just any credit card to completely pay off other debts. This action is called a balance transfer and is unique to balance transfer credit cards. Using these offers, you have the ability to transfer all of your debts to the one, easy to manage account. Obviously, it’s easy to see why so many people are interested in these offers. The bottom line is, lower interest rates could mean hundreds or even thousands of dollars saved over the term of a debt. Not to mention, consolidating several accounts into one comes with the benefit of only having to remember one due date, one payment amount and one set of terms. With several accounts, trying to remember all the details can get a bit hectic. 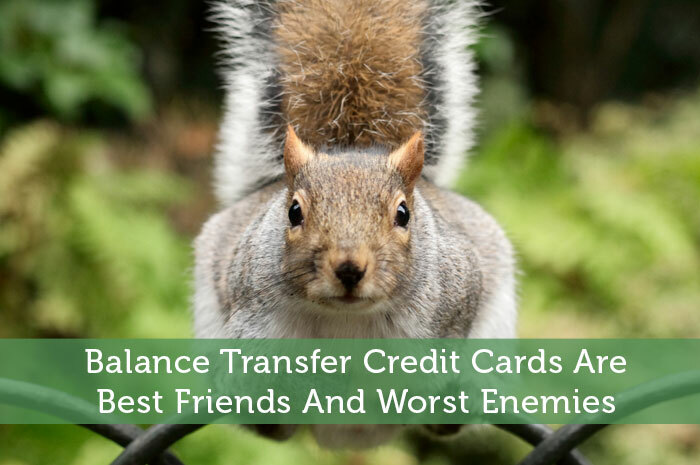 In What Cases Can Balance Transfer Credit Cards Be Your Worst Enemy? They Are Not A Good Debt Relief Option – Because these offers come with low promotional interest rates and allow you to consolidate debts, consumers often confuse them as credit card debt consolidation programs. This is not the case. Although, the lower interest rate is nice, if you are experiencing a financial hardship, you may want to look into other options like credit card hardship programs, debt consolidation and debt settlement. Some Lenders Can Be Very Sneaky – Before applying for balance transfer credit cards, you should always take the time to compare the offers available to you. In this comparison, it’s important to read the fine print in the terms and conditions of the offers you are comparing. And, I mean, read the entire terms and conditions from top to bottom. Some lenders find ways of putting fee based terms where they don’t think you will look. It’s important that you know what you’re getting into so, before applying for any balance transfer credit card, make sure to go through the terms and conditions with a fine toothed comb. Thanks again for taking the time to read my post. Don’t forget, I love to read your comments! They help me to decide what to write about and some of the questions I’ve been asked have been delightfully challenging so, please keep the comments up! I’ll see you all next Monday! Sounds like they could be a good option, but I think I’ll stay away from them if at all possible. I only use a credit card for the rewards and pay it off more than once a month. I hope that I’ll never be in enough debt to have to use this kind of program. Hey Jake, thanks for your comment. It looks like you’re definitely great with credit cards from all the comments that I’ve responded to from you. I hope you never need balance transfer credit cards either. That’s a good way to do things. I think it’s majorly important to stay out of debt. I think I’ll take a page out of your book and use the credit cards just for the rewards. I used balance transfers all of the time when I was getting out of debt. They saved me thousands in interest fees. The transfer fee was well worth it for me, but you have to make sure you can pay off the amount transferred before the end of the promo period. That is the key. He Grayson, thanks for your comment! I have to agree! I don’t use credit cards anymore, but I had considered that in the past. Lots to understand. If you can make it by without credit cards, that’s awesome although, building credit scores could be hard. Anyway, congrats and thanks for your comment! I agree that these card companies can be very sneaky. Once a higher interest charge hits later on down the road you may not even notice it on your bill/statement unless you are looking closely at the fine print. Hey Todd, thanks for your comment. That is a real concern for many! I’ve always paid my credit card in full every month but I have heard of people transferring money to low or 0% credit cards. Hey CBB, paying off monthly is the best way to go but, it’s not always possible. I’m glad it works out for you and appreciate your comment! I like you point about comparing cards before switching to a lower interest card. Thanks Terry, I’m glad you enjoyed my work! 0% balance transfers really helped us out when we were paying off credit card debt. You do need to read the fine print. Sometimes my husband and I would get what looked like identical offers, but one would be a percent lower in fees. My best advice is to stay out of credit card debt, but don’t be afraid to look for lower interest cards if you do have it. Great advice Kim, couldn’t have put it better. The best way to stay out of credit card debt is to use your credit cards responsibly in the first place! Sociologists study “Illusory Superiority” – a cognitive bias that causes people to overestimate their positive traits, and underestimate their negative one. For example, 93% of sampled U.S. drivers rate themselves as being in the top 50% for driving skill. Likewise most people think they can manage their money well enough to beat the banks at the balance transfer game. The banks have been sending these enticing offers for years because they have the data suggesting otherwise: most people fall into the trap of paying more interest to them. I guess you can’t beat that humans are creatures of habit! With this point in mind then I think the best recourse is to do a thorough research when signing up for balance transfer cards, use the card responsibly and ultimately if possible, wean yourself off credit cards completely…go debit cards instead!